Open-Ended Maths Activities discusses the features of 'good' mathematical questions. It provides practical advice on how teachers can create their own open-ended and problem-solving questions, and use them effectively in the classroom.Open-Ended Maths Activities:includes over 80 ... read full description below. Open-Ended Maths Activities discusses the features of 'good' mathematical questions. 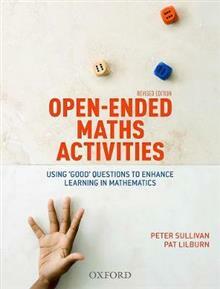 It provides practical advice on how teachers can create their own open-ended and problem-solving questions, and use them effectively in the classroom.Open-Ended Maths Activities:includes over 80 pages of 'good' questions for teachers to use in the classroomorganises questions into content areas (Number and Algebra, Measurement and Geometry, Statistics and Probability)indicates the suggested age level of students for each questionis written by a well-established expert in the field of teaching and learning mathematics, and an experienced author with a primary teaching background.